» Will Lead Retain Its Sheen In Batteries? Whenever the question of dependability and inexpensive batteries will be raised, including the cost-per-watt base, Lead batteries will stand out as the first preference. There would definitely be an advantage to Zinc based batteries in home-office sector, being more environment friendly. Ultimately, market will drive the demand, and the market of automobiles, UPS and electrification storage is set to grow mammoth across the world. Asia-Pacific battery market is expected to grow significantly in the coming decade as a result of increased electrification activities in the region. Countries like Japan, China, and South Korea are leading the market in the region and countries such as India and Australia have shown tremendous growth in the past few years. Global battery market is expanding. The growth is coming from both automotive and industrial sectors powered by usage in telecom, railways, power and other industrial applications. Primarily, batteries are divided into two categories – primary and secondary. Primary batteries are used once, and then discarded. They have the advantage of convenience and less cost per battery, with the downside of costing more over the long term. Generally, primary batteries have a higher capacity and initial voltage than rechargeable batteries, and a sloping discharge curve. Most primary batteries do not presently require special disposal. Secondary batteries are the rechargeable batteries. They have the advantage of being more cost-efficient over the long term, although individual batteries are more expensive. Generally, secondary batteries have a lower capacity and initial voltage, a flat discharge curve, higher self-discharge rates and varying recharge life ratings. Secondary batteries usually have more active (less stable) chemistries which need special handling, containment and disposal. Ni-Cd and small-size Lead Acid batteries require special disposal and should not be simply thrown away. In February 2018, experts at Advanced Automotive Battery Conference in Germany indicated that Lead batteries will remain the dominant battery technology on the world’s roads for the foreseeable future. The growth in passenger car, commercial vehicle and motorcycle industry, along with growing application of energy storage, is expected to drive industry demand for batteries. Increasing requirement of UPS in industrial sectors including oil & gas, manufacturing, chemical, and healthcare has further spurred batteries demand. It is also true that Lead Acid batteries have over 150 years of existence. Invented by the French physician Gaston Planté in 1859, Lead Acid was the first rechargeable battery for commercial use. Despite its advanced age, the Lead chemistry continues to be in wide use today. There are good reasons for its popularity; Lead Acid is dependable and inexpensive on a cost-per-watt base. There are few other batteries that deliver bulk power as cheaply as Lead Acid, and this makes the battery cost-effective for automobiles, golf cars, forklifts, marine and uninterruptible power supplies (UPS). The global Lead Acid battery market size was valued at USD 46.6 billion in 2015 and is expected to reach USD 84.46 billion by 2025, according to a new report by Grand View Research, Inc. Expansion of the automotive industry in China, India, Brazil, Mexico, South Africa, Indonesia, and Germany is anticipated to drive industry growth. Furthermore, increasing utilization of energy storage systems and UPS in industries including mining, oil & gas, nuclear power, electricity generation, gas turbine, construction, hospitality, banking, manufacturing, and off-grid renewable is anticipated to drive Lead acid battery demand over the forecast period. Transparency Market Research projects the global UPS market to rise at a CAGR of 7.5% between 2017 and 2025. India’s UPS market has been forecast to grow at a CAGR of more than 9% by 2023. But with that, there are certain drawbacks as well. Lead Acid based batteries have low specific energy, poor weight-to-energy ratio, slow charge, fully saturated charge takes 14-16 hours, must be stored in charged condition to prevent sulfation, limited cycle life; repeated deep-cycling reduces battery life, flooded version requires watering, transportation restrictions on the flooded type and not environmentally friendly. 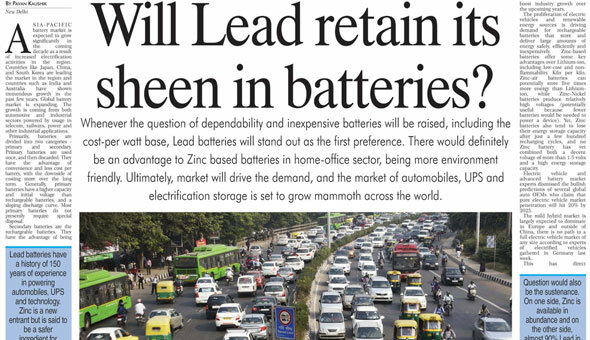 There has been a debate on whether the Zinc batteries will overtake Lead batteries in the automobile sector. Many researches are being conducted throughout the world and there seems to be a sharp analysis of pros and cons. A Canadian commodity research firm has said that older Zinc battery technology could be a more efficient grid-scale energy storage solution than the much-hyped Lithium equivalent, possibly boosting demand for a metal. What is not normally considered by investors is the possibility that a boring base metal might become an exciting technology metal. It is believed that this is precisely what may happen in the next few years to Zinc, as various firms bring their inexpensive Zinc-air stationary batteries to the market as a cost-effective grid-storage technology. Zinc-air batteries can become a serious player in the grid-storage market and then technology investors will also have to begin to look at Zinc in the same way that they have begun to look at Lithium and Cobalt. In the last few years, several Zinc battery companies have made strides in overcoming problems with their electrically-rechargeable Zinc-air batteries that make them not only viable entrants in this space, but, arguably, the best such storage devices, outpacing flow batteries and all other technology. “Right now is the time to grab the market and take this global approach,” Craig Wilkins, founder and Vice President of business development at ZAF Energy Systems Inc., told the audience at the International Zinc Association conference. New battery chemistries that include Zinc are ready for large-scale deployment in the energy storage industry, as the materials now meet the necessary criteria to achieve widespread adoption. Craig Wilkins in the conference also spoke that Zinc batteries have the potential to open a large market for the metal, since they now meet the five critical factors needed for widespread adoption. First and foremost is cost. “Safety becomes more important as it comes close to populations,” he said. The public perception of Lead is shifting to a more negative outlook, lending credence to the adoption of Zinc as a safer alternative. The public perception is going against Lead, and public policy is starting to go in that direction. With the exception of Copper, Zinc’s competitors in the market aren’t available in great supply. The world is laden with Zinc and Copper, but it won’t be cheaper to build batteries out of Copper. Approximately 230 million tonnes of Zinc are available globally in commercial reserves, with 14 million tonnes available in the United States alone. Meanwhile, global commercial reserves for Lead total 79 million tonnes, nickel 71 million tonnes, vanadium 13 million tonnes and Lithium 10.1 million tonnes. The cells, manufacturing and chemistry of the material must also be scalable. “If you are going to go big, you have to look at the scale of the chemistry and the ability to turn it into large applications. Finally, the product’s chemistry and its system must cater to a variety of services in order to impart the maximum economic benefit. It has to service different markets. We tend to see a performance gap in existing technologies to meet energy storage needs” Craig Wilkins added. Battery recycling is the process of recycling used batteries from various sources, preventing them from going into municipal wastes and landfills for disposal. Almost all household batteries, battery packs from mobile phones, power tools, laptops & remote control units, and car batteries can be recycled. Batteries comprise several toxic and hazardous metals and heavy metals such as Lead, Mercury, Nickel, and Cadmium. These can contaminate soil or underground and surface water resources if they go into landfills. Battery recycling prevents the degradation of environment and potential health hazards caused from disposed batteries. The global battery recycling market was valued at USD 8.10 billion in 2016 and is projected to reach USD 11.83 billion by 2022, at a CAGR of 6.5% from 2017 to 2022. The market is expected to witness growth in the coming years, owing to the large number of batteries in-use and stringent environmental regulations by the local and national governments in the battery recycling market. Lead Acid battery chemistry is expected to be the fastest-growing chemistry segment of the global battery recycling market. Lead is a highly recycled material. It can be recycled infinite number of times. Lead Acid batteries are among the world’s most recycled product and account for over 80.0% of the worldwide Lead usage with high recycling rate across the globe. Lead batteries have achieved around 99% of recycling rate in North America and more than 90% recycling rate across the globe. The extracted Lead from battery recycling process is reused as a raw material in the manufacture of batteries or other products. Secondary Lead production i.e. recycled Lead production, is the major source of Lead metal production across the globe. Furthermore, usage of secondary Lead prevents the exposure of the hazardous metal into the environment. The global battery recycling market analyst says one trend in market is subsidies to encourage battery recycling. Lithium-ion batteries are gaining momentum in the global battery market. The gap between standard Lead Acid batteries (the oldest battery technology in the battery market) and Lithium-ion batteries is drastically reducing. This is owing to numerous features and benefits that Lithium-ion batteries provide over standard Lead Acid batteries. However, the concern that arises with the extensive use of Lithium-ion batteries is the availability of Lithium metal worldwide. According to the battery recycling market report, one driver in market is widening Lithium supply-demand gap. Although there is an adequate amount of Lithium resources available globally to cater to the demand, almost 70% of the global Lithium reserves are concentrated in South America’s ABC (Argentina, Bolivia, and Chile) region. Owing to the sparse accessibility of the raw material (available only in geography) there is an integral risk. Some challenges are likely to influence the Lithium supply in the future. The companies are the key players in the global battery recycling market: Call2Recycle, Exide Technologies, Gravita India, and Johnson Controls. Other prominent vendors in the market are: East Penn Manufacturing, ENERSYS, Umicore, Retriev Technologies, G & P Batteries, The Doe Run Company, Gopher Resource, RSR Corporation, Terrapure Environmental, COM2 Recycling Solutions, World Logistics, Aqua Metals, Raw Materials Company, Engitec Technologies, and Vinton Batteries. The proliferation of electric vehicles and renewable energy sources is driving demand for rechargeable batteries that store and deliver large amounts of energy safely, efficiently and inexpensively. Zinc-based batteries offer some key advantages over Lithium-ion, including low-cost and non-flammability. Kilo per kilo, Zinc-air batteries can potentially store five times more energy than Lithium-ion, while Zinc-Nickel batteries produce relatively high voltages (potentially useful because fewer batteries would be needed to power a device). Yet, Zinc batteries also tend to lose their energy storage capacity after just a few hundred recharging cycles, and no Zinc battery has yet combined both a decent voltage of more than 1.5 volts and a high energy storage capacity. Electric vehicle and advanced battery market experts dismissed the bullish predictions of several global auto OEMs who claim that pure electric vehicle market penetration will hit 20% by 2025. The mild hybrid market is largely expected to dominate in Europe and outside of China, there is no path to a full electric vehicle market of any size according to experts of electrified vehicles gathered in Germany last week. This has direct consequences on the battery technologies used. “Developments in electric vehicle technology are moving quickly but improvements in Lead battery technology speeded up faster than anyone could have expected”, according to Dr. Boris Monahov, speaking at the Advanced Automotive Battery Conference in Mainz Germany. “If the EV market even reaches 25% that means the key energy storage system used to electrify cars in 2025 will be the advanced Lead battery technology,” said Dr Monahov of ALABC (Advanced Lead Acid Battery Consortium), the pre-competitive research organization representing the Lead battery industry. The Lead battery industry has moved quickly to meet automotive manufacturers’ requirements for the huge micro-hybrid and start-stop segments of the electrified vehicle market. The main criteria for choosing an advanced Lead battery remains its unique combination of cost, safety, reliability, excellent performance and high recyclability advantages, compared to newer battery technologies, but on top of this, the industry is now confident they are close to meeting car manufacturers’ targets for other key technical criteria. Globally, the automotive market is on course to cross the 100 million units’ threshold in 2019. India, now the world’s 4th largest automobile market, has outpaced Germany with 9.5% growth in sales. Germany sold 3.8 million units and has grown by a modest 2.8 percent last year. According to IHS Markit, India is likely to continue to expand its automotive market by nearly 10 percent a year and will overtake Japan by 2020 which stands at third-place as of now. All the global producers of metals – Zinc-Lead-Lithium and of Sulphuric Acid, will have an important role to play in the near future. 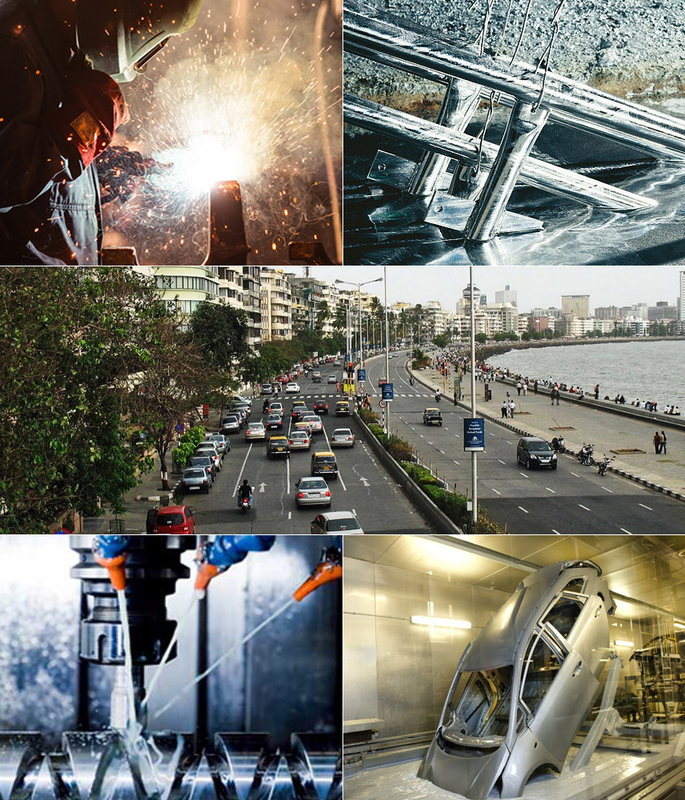 In India, Hindustan Zinc is the largest producer of Zinc as well as Lead and Sulphuric Acid, and India is one of the most dynamic market for automobile industry and for immense scope in technology. Perhaps India will lead the next phase of batteries market in the world. The final question remains – Will Lead Retain its Sheen in Batteries? Probably Yes. Whenever the question of dependability and inexpensive batteries will be raised, including the cost-per-watt base, Lead batteries will stand out as the first preference. There would definitely be an advantage to Zinc based batteries in home-office sector, being more environment friendly. Ultimately, market will drive the demand, and the market of automobiles, UPS and electrification storage is set to grow mammoth across the world.